Illinois neon underglow usage is governed by the state's Code. All relevant laws, rules and regulations pertaining to vehicle lighting including car underglow in Illinois have been provided below. Make sure to examine the regulations carefully and do not use any restricted lights. Usage of neon underglow lighting is governed by Illinois Vehicle Code, Chapter 12: Equipment of Vehicles, Article 2: Lights and Lamps. Is neon underglow legal in Illinois? Illinois law restricts vehicles from having additional lighting not specified in the Vehicle Code. Therefore it’s our conclusion that in Illinois neon underglow is illegal. In addition the law does not allow the usage of flashing lights nor emitting red color in front of the vehicle. Furthermore the law forbids possession of any rotating, oscillating and flashing lights capable of producing an effect which may give the appearance of an emergency vehicle. Ensure you never use any illumination which is capable of displaying blue and/or red colors, or any kind of flashing underglow. An over-eager LEO could charge you with a Class A misdemeanor simply for possession of such a system. Legally permitted aftermarket lights in the state of Illinois only include: up to two side cowl or fender lamps, and one running board courtesy lamp on each side of your car. These lights must emit either white or amber non-glaring light. Illinois does make exceptions for motorcycles. Below are all relevant excerpts from Illinois Vehicle Code that limit and restrict the usage of after-market lights including street glow on vehicles. Sections 12-207 to 12-211 include information on permitted car lighting, and Section 12-212 specifically restricts all additional vehicle lighting not included in other sections. Sec. 12-209. Additional Lighting Equipment. (a) Any motor vehicle may be equipped with not more than 2 side cowl or fender lamps which shall emit an amber or white light without glare. (c) Any motor vehicle may be equipped with one or more back-up lamps either separately or in combination with other lamps; but any such back-up lamp or lamps shall not be lighted when the motor vehicle is in forward motion. Sec. 12-212. Special restrictions on lamps. (a) No person shall drive or move any vehicle or equipment upon any highway with any lamp or device on the vehicle or equipment displaying a red light visible from directly in front of the vehicle or equipment except as otherwise provided in this Act. (b) Subject to the restrictions of this Act, flashing lights are prohibited on motor vehicles except as a means for indicating a right or left turn as provided in Section 12-208 or the presence of a vehicular traffic hazard requiring unusual care as expressly provided in Sections 11-804 or 12-215. (c) Unless otherwise expressly authorized by this Code, all other lighting or combination of lighting on any vehicle shall be prohibited. Similar restrictions exist for blue and amber lights. Sec. 12-215.1. Possession of oscillating, rotating, or flashing lights in motor vehicles; police equipment, markings, and other indicia of emergency vehicle authority. (a) A person, except those given exceptions in Section 12-215 or 12-609 of this Code, may not possess or be in actual physical control of oscillating, rotating, or flashing lights or other indicia of emergency vehicle authority within any portion of a motor vehicle, including but not limited to wig-wags, red and blue LEDs, sirens, mounted or affixed devices or other equipment, markings or indicia of emergency vehicle authority. (b) A person found guilty of violating this Section is guilty of a Class A misdemeanor. Sec. 12-218. Auxiliary accent lighting on motorcycles. (a) A motorcycle registered in this State may be equipped with, and a person operating the motorcycle may use, standard bulb running lights or light-emitting diode (L.E.D.) pods and strips as auxiliary lighting with the intent of protecting the driver. (7) shall not be attached to the wheels of the motorcycle. As per 12-215.1, even mounting a vehicle with lights capable of producing red and blue illumination can be punishable and is considered a Class A misdemeanor. This is especially important for LED underglow which is typically capable of changing colors. Our information about car neon underglow laws in Illinois was last updated in 2018 and checked in 2019. In case any info we provided is not up to date or correct be sure to contact us so we can revise it. Thank you! Check our data with your local law enforcement or other relevant agencies! Illinois underglow laws in certain cities or counties may be different from state legislation. While we do our very best to provide the most accurate information about LED and neon street glow usage we will not be held liable for any potentially incorrect or misinterpreted info. 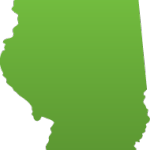 Illinois is a state in the Midwestern United States. It is the 5th most populous and 25th most extensive state, and is often noted as a microcosm of the entire country. With Chicago in the northeast, small industrial cities and great agricultural productivity in central and northern Illinois, and natural resources like coal, timber, and petroleum in the south, Illinois has a diverse economic base and is a major transportation hub. The Port of Chicago connects the state to other global ports from the Great Lakes, via the Saint Lawrence Seaway, to the Atlantic Ocean; as well as the Great Lakes to the Mississippi River, via the Illinois River. For decades, O'Hare International Airport has been ranked as one of the world's busiest airports. Illinois has long had a reputation as a bellwether both in social and cultural terms and politics. Have questions about traffic or neon glow laws in Illinois?